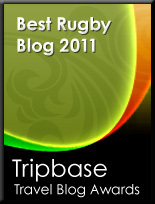 TOTAL FLANKER...a rugby blog: Is that all we've got? Hopefully this is not a sign to things to come this weekend, but today England lost all three of their pool games at the Wellington Sevens including, unbelievably, a 21-17 defeat to the Cook Islands. That's the mighty Cook Islands (yes, you read it right the first time) who, despite having a combined population of just 21,000, were obviously too good for our professionals from the Premiership. The humiliating defeat, combined with losses to Wales (15-7) and Fiji (17-7), means that England now "progress" to the consolation bowl quarter-finals where they face Canada. England Sevens coach Ben Ryan labelled the team's performances as "disappointing." As an American who has seen "American Sports" teams like USA baseball and mens basketball get humiliated in Olympic and World cup tournaments, all I can say Flanker, is that the first couple of losses hurt. After awhile you get numb to it. I saw the plate and shield finals on TV this morning. At least England showed some fight in coming back against Argentina.